Enjoy panoramic views of both Cote d'Azur and Riviera dei Fiori during your stay in Liguria, Italy. In the oldest part of the town (Vallecrosia Alta) olive and vine cultivation has given way to ornamental plants: floriculture is now the town's main activity and it holds a very important annual flower market. The outstanding pieces of architecture are the eighteenth-century church of Santa Crescenza (now deconsecrated) and the sixteenth-century fort-house. The sixteenth-century gate leads into the lower part of the town, which has curved-brick tiles on the roofs that are very common in France. The parish church of Sant'Antonio Abate dates from the fifteenth century and has some interesting statues and stuccoes on the façade. The oratory of the Assunta is from the seventeenth century, as are the interior furnishings and the slender bell tower. The sanctuary of Santa Maria delle Grazie was the old parish church and dates from the twelfth century. A sixteenth-century bastion is enclosed in the garden of the Istituto Sant'Anna. The church of San Rocco was rebuilt in the twentieth century but has retained some Romanesque features. 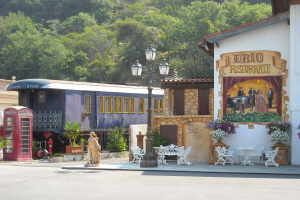 The original song museum (with a research centre and recording studio) is unique in Europe and has been built in a railway convoy from the early twentieth century. It collects records, music sheets, instruments and rarities regarding Italian songs from the nineteenth century to modern times. The antiques market called "U cantun dell'antigu" takes over all of the town squares on the second Sunday of every month. Vallecrosia lies between the Cote d'Azur and the Riviera dei Fiori, both of which are visible from the seafront. Its Roman origins are confirmed by the passage of the Via Julia Augusta across the Verbone River, by the discovery of tombs from the fifth century AD and by an altar dedicated to Apollo that was later incorporated into the church of San Rocco. In 1686, Vallecrosia joined the "Magnificent Community of the Eight Localities" in order to escape from the fiscal pressures of nearby Ventimiglia. Vallecrosia is one of the villages in the province of Imperia which lies in the Liguria region. 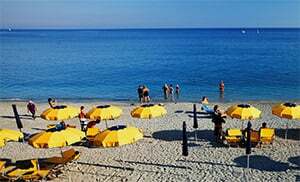 There are several other villages near Vallecrosia, for example: Borghetto San Nicolo (9.3 km), Bordighera (5.2 km), and Vallecrosia Alta (1.2 km). take the highway exit to Bordighera and follow the E80 up to Vallecrosia.